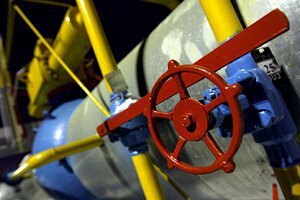 Crimea has blocked the supply of Ukrainian gas for four days. Henichesk is receiving gas produced in Ukraine alone, no Russian gas has been or is supplied to the city, the press service of the Ukrainian oil and gas company Naftohaz Ukrayiny has said. Henichesk is not directly connected to other sections of the gas transport system in mainland Ukraine. The needs of the city's population in the summer are covered by gas extracted at the Strilkovske deposit in Kherson Region. The surplus of gas extracted in the summer, which cannot be used by Henichesk residents, is pumped into the Hlibovske underground facility for temporary storage. In the winter, Ukrainian gas is pumped out of the storage and to Henichesk to meet its demand at peak times. Since March 2014, the Strilkovske deposit has been managed by the private Ukrainian gas company Plast. "Since 1 January 2016, the occupying authorities of the Autonomous Republic of Crimea have for four days blocked Kherson gas stored in the Hlibovske underground storage facility on Crimean territory. Its volume is more than enough to cover the city's demand by the end of the heating season," Naftohaz Ukrayiny said. As reported earlier, pressure in the city gas pipeline fell due to cold snaps. As a result, 1,800 gas customers in high-rise buildings and 400 customers in private houses were left without gas supply. On 4 January, the situation in Henichesk took a scandalous turn. Russian Deputy Prime Minister Dmitriy Kozak said that the city mayor "asked the Russian side for gas due to cold weather", after which Russian President Vladimir Putin issued an instruction to pump gas to Henichesk from Crimea. However, Henichesk mayor Oleksandr Tulupov said that he made no such requests to Putin. As of 5 January, the city, which is home to around 25,000 people, receives about 20,000 cu.m. of gas from Crimea and 70,000 cu.m. from the Strilkovske deposit in Kherson Region, which is not enough. UPDATE: Gas supply to Henichesk has been restored in full as of midday, the deputy head of the Henichesk district state administration, Oleksiy Syshchenko, has told the 112 Ukrayina TV.